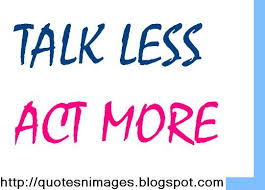 It’s time to Talk LESS and Act MORE. Social media has a way of allowing everyone to look like their life is INCREDIBLE. But what I know is many times what we see is a fraud. The truth many times is quite the opposite. So now I am in a season where I have learned to talk less about the things I want to do and actually show people the results. If you really want to stand out from the crowd, get off the computer so much and go out and complete your goals. Success shows up when we work. Social media might help up about 10% but 90% of success will come from our actions.